A Viking raid led by Weland attacked Winchester and set the town alight. Weland tried to fight further inland but was defeated by an Anglo Saxon force. King Aethelbald King of Wessex died. 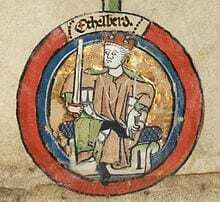 He was succeeded by his brother Aethelberht of Kent thus uniting Wessex and Kent. King Donald of Scotland died. He was succeeded by his nephew Constantine I.
Aella challenged Osbert for the kingship of Northumbria and won. King Aethelberht of Wessex died. He was succeeded by Aethelred I of Wessex. A Great Heathen Army of Vikings led by Ivar the Boneless and Halfdan Ragnarsson invaded East Anglia. They accepted a payment of horses from King Edmund of East Anglia to go away. The Great Heathen Army marched north to Northumbria and took the city of York. Aella and Osbert of Northumbria joined forces against the Great Heathen Army. They were both killed by the Vikings. Having conquered Northumbria the Vikings installed Egbert I as a puppet king. Aethelred’s brother-in-law, Burgred of Mercia, appealed for help against a Viking attack. Aethelred and his brother Alfred marched north with an army but Burgred paid the Vikings to leave thus avoiding battle. The Viking force led by Ivar the Boneless entered Mercia and sacked the monastery at Peterborough killing the monks and abbot.